Using an inquiry based approach, Michigan high school students will learn about the foundations of American government by studying the Constitution and exploring how it works today. The Founders did not create our system of government out of thin air. They were well-read and lived at a time when many new ideas about government were being developed. They took their inspiration from the ideas of a variety of thinkers, but each of the following had a distinct influence on what government in the United States would become: Aristotle, Thomas Hobbes, John Locke, Baron de Montesquieu, and Jean Jacques Rousseau. Civic Life, Chapter 2: How Well are we Living Up to the Ideals and Principles Established at the Founding? The Declaration of Independence is key to understanding American government. Written in June and July of 1776, by the Committee of Five (Thomas Jefferson of Virgina, John Adams of Massachusetts, Benjamin Franklin of Pennsylvania, Robert Sherman of Connecticut, and Robert R. Livingston of New York), the document was forged in a time of crisis. American colonists were engaged in a war on their own soil against their mother country, England , who possessed the most disciplined military in the world. This document was like none previously seen. 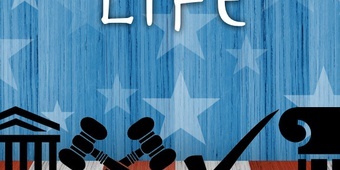 Civic Life, Chapter 3: Is the Constitution Relevant and Effective Today? In Democracy in America. Alexis de Tocqueville referred to America as “The Great Experiment.” But what did he mean by saying that America’s constitutional democracy was an experiment? America was founded on key principles which, are the same principles that govern our nation today. America’s Founders initiated the experiment in democracy by trying out a new form of government, including the ideas that power should ultimately come from the people, that government power should be limited, and that individual liberties of all peoples should be protected. Civic Life, Chapter 4: How Has the Meaning of Citizenship Changed Over Time? A citizen is someone who is entitled to the legal rights granted by a state, and who is obligated to obey its laws and to fulfill certain duties. Living in the United States does not mean that someone is automatically a citizen. Permanent residents, people who have been lawfully admitted to the United States, are also granted certain legal rights and protections even if they are not citizens. For example, residents can live and work anywhere in the United States, attend public schools, join our armed forces and can also qualify for some Social Security benefits as well. Typically, people who are granted permanent resident status are immigrants who are related by birth or marriage to U.S. citizens or possess important job skills needed in the United States. Unlike citizens, permanent residents may not be able to hold public office or vote in elections. Why should someone consider becoming a citizen if they are not? Check out a list of all of the privileges of citizenship in the United States. Civic Life, Chapter 5: Is the common role of “watchdog” that political parties, interest groups, media, and individuals play in the development of public policy more important than the methods each entity employs? Have you ever stopped to think about why we have certain policies, laws and regulations? For instance, why is the driving age 16 or the drinking age 21? Why are there nutrition labels on all food packages? Why in Michigan, do you have to go to school until you are 18? Do you believe the United States should spend $601 billion dollars in 2016 on our national defense? Do you agree with how the United States handles issues with immigration? Do you even know how immigration issues and situations are handled? These are all examples of public policy. Civic Life, Chapter 6: How Effective is the Legislative Branch in Governing? In a letter written to James Madison in 1797, Thomas Jefferson wrote, “The principle of the Constitution is that of a separation of legislative, Executive and Judiciary functions, except in cases specified. If this principle be not expressed in direct terms, it is clearly the spirit of the Constitution…” The separation of powers was one of the fundamental principles of the Constitution’s Framers. The Legislative Branch is sometimes referred as the “people’s branch” since the Founders believed and intended the legislative branch to closely reflect the will of the citizens.